Recently, a friend shared with me a painting by Catherine Prescott. The caption simply included the artist's name and a title, Legacy: Portrait of Val. Lacking any further clues as to artistic intention or historical context, I was immediately drawn to the uncommonly honest depiction of a real woman. It was no surprise to discover that Legacy had been selected as one of 48 finalists for this year's Outwin Boochever Portrait Competition. 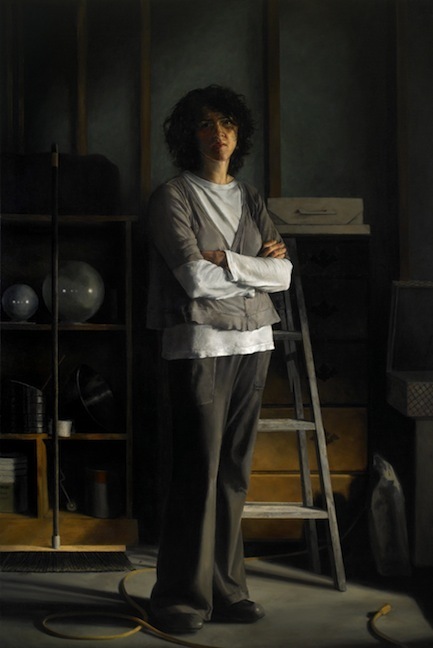 In the painting, the subject wears pocketed grey sweatpants and other drab clothing. The portrait is set in what appears to be Val's garage, judging by the concrete floor and metallic wall, and by Val's proprietary, arms-crossed stance. Daylight enters the cave-like space, spot-lighting Val and several objects among her: a broom, some drawers, a garden hose. The haphazard stacking of furniture and objects reflects a room whose practical function overrides the importance of its appearance. In the same way that Val's clothes are not geared toward the public eye, this is not a room that is meant to be seen. Yet despite these associations, the space and subject are stunning. The light recalls Caravaggio's dramatic chiaroscuro, and there is a satisfying stability to the centralized, triangular composition. Using traditional technique, Prescott orchestrates the elements at hand in Legacy into compelling pictorial harmony. Consequently, Val is dignified, and her backdrop reads more like a positive mark of her practicality than any sort of denigration. This is a woman who values getting things done. Both her gesture and the unpretentious setting tell us that she is secure in her skin. What makes this painting so astounding is that it links female beauty (and Val is beautiful) to an impression of a woman's character as much as to the outline of her body. This action, moreso than Prescott's depiction of 21st century artifacts, makes the portrait modern and relevant. It soon dawned on me that I had seen Catherine Prescott's work before; her painting Northern Interior had been included in the Women Painting Women group's exhibition, "The Expedition and Beyond," at Principle Gallery. I remembered dwelling on Prescott's painting at the show. 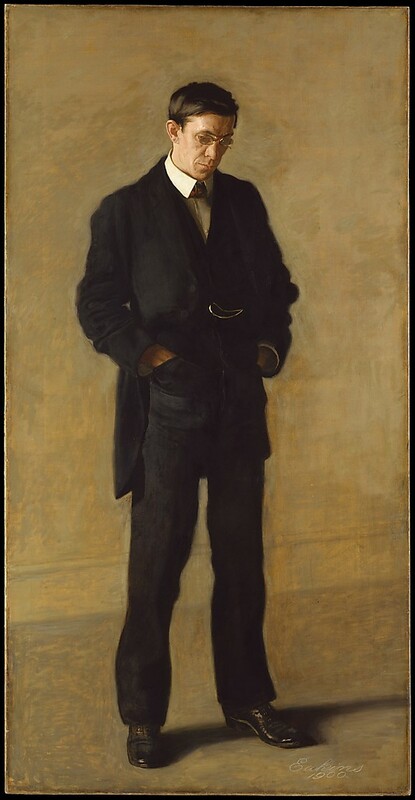 Looking back at Northern Interior, I'm reminded of Thomas Eakins's The Thinker: Portrait of Louis N. Kenton. In the New American Wing of the Met, Eakins's portrait stands out among all the proud, self-presenting figures. The man's downward gaze somehow makes him more raw and exposed than any of his companions in the gallery (including Sargent's Madame X and a jaunty James McNeill Whistler). This vulnerability makes for a more complex portrait. Like Eakins, Prescott presents her subject looking down, in a pose that communicates relaxed confidence and, at the same time, unsuredness. Similarly in Legacy, an essentially confident pose is complicated by a facial expression that betrays some unknown pain. What I like best about 19th century writers like Thomas Hardy and Edith Wharton is not their style of writing or the style of life they describe, but their insight into human character, both its beauty and its flaws, as reflected in their interior life. Portraits like Northern Interior and Legacy: Portrait of Val continue this long-standing artistic tradition of articulating complex human interiority. Particularly, they visualize the internal balancing act, common to all people, between stability in one's selfhood and fragility. Personally, I find it especially novel and exciting to see women in these paintings, treated with such uncompromising deference to their essential humanity. Catherine Prescott's Legacy: Portrait of Val will be featured in the 2013 Outwin Boochever Portrait Competition Exhibition at the National Portrait Gallery in Washington, D.C., opening March 23. Image of The Thinker: Portrait of Louis N. Kenton courtesy of The Metropolitan Museum of Art, met museum.org. All other images courtesy of Catherine Prescott.